This is a behind-the-scene account of what took place in our journey to the wedding of Su and Jay.It was just only about a year ago in the month of May that we landed in Salt Lake City to enjoy family blessings of events that culminated in Fei's wedding to Christopher on 29th May 2010. 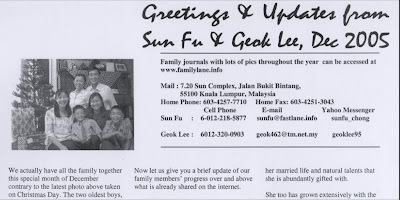 We received early indication that we would soon be back when Su announced her engagement on Sept 18 of 2010 with a date fixed for her wedding announced later to be on June 18 of 2011. She was such a planner and good communicator that I could easily log the series of events that took place since then that began our real journey. This journey turned out to be one of a great challenge and a need of miracles also as Su's plan had the goal of having ALL our immediate family members to be at her wedding! See how the journey started and progressed here. The goal was near accomplishment as our plane touch downed at Salt Lake City on 11th June. The two other boys and their cousin had arrived earlier on 6th June and the four of us were the 2nd batch to arrive. We would be staying with the parents of Jay, Grace and Chuck Liu, a wonderful couple with a great family that we have become related to us by the marriage of our daugher with their son. We first got to know Jay and his parents last year when Jay joined us in our family trip through 3 states of Utah, Idaho and Wyoming. See the Photo Set and captions. Our Chong family reunion is almost complete with just Fei and Christopher missing who will be driving to join us from California in a couple of days time. We are happy to have Ying Er, a close cousin of our children join us from Singapore. On June 16, on the birthday of Ern and 2 days after Fei's birthday, we have the photo here of all of us together for an Asian buffet in Utah, on American soil for the very first time in our lives! Mom is happy to celebrate another joint birthday together which has not been possible for a long time for real other then our online webcam celebrations that we have become accustomed to! Soon we have other extended family members join us such as Uncle Roy and his daughter Juliana, another cousin of the children. 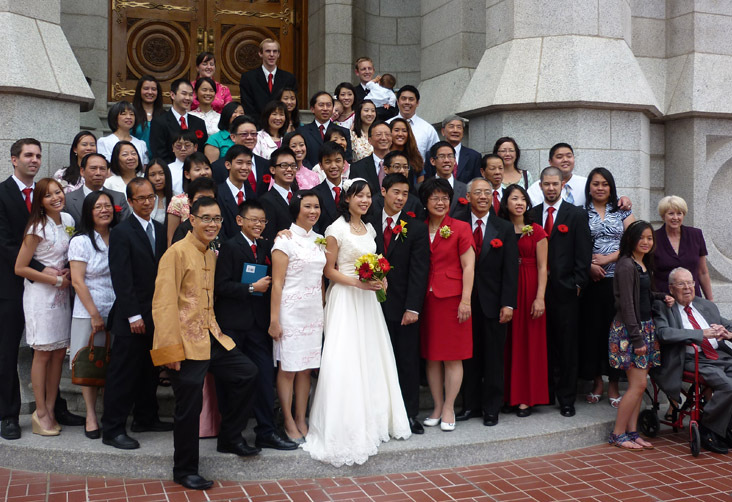 A wedding in the family is indeed a happy moment for both families of the bride and groom. Here is Grace, Jay's mom in the center hugging her sister who came all the way from Arizona with her family to celebrate with us. Here is Jay's dad, Chuck who have become very familiar with the children and has been a great host to us. He has always been willing to take time off to bring the boys to different places of interest whenever possible. I like to share a very personal moment here in our blog which has always been one of open sharing as stated in the header if you scroll up to read at the top. About the last day of our trip I was up early in the morning and Chuck and Grace were having their morning breakfast prayer while I was on the same table updating the computer. By that time, my heart has been filled with so many happy moments to see the families together, adults and children playing and working together in a myriad of activities over the two weeks. Chuck with his soft spoken voice said the prayer and as he prayed flashes of happy moments passed through my mind and tears started flowing from my eyes. After the prayer Chuck came to me to console me not to feel sad, feeling that I was leaving Su and assured me that she will be in good hands. I hugged him and thanked him for everything his family had done for us and clarified my tears were not of sadness but of joy! The union of Su and Jay in their marriage united also the Chong and Liu families with their friends. Family and Friends are the real joy and happiness of life ! See from the day I turned on my 'imaginary camera' on life and myself, and later with a real camera to take photos and reflect on them, I've learnt to see from photographic memories and real photos what makes up real joy and happiness of life. We had felt that again with the reunion of our family and friends on this wedding trip. The entire photo sets of the wedding truly reflect great moments of joy and happiness and it was worth whatever challenges it took for the entire family to be there. My cup felt really full and running over to see Su unite with Jay and our families together. The completed Photo Booth was then taken apart and brought to the banquet and reception site. Guests could take home with them their photo booth photos of themselves. See the various photos taken here. Photographs truly help me remember the true Joy and Happness of our lives!